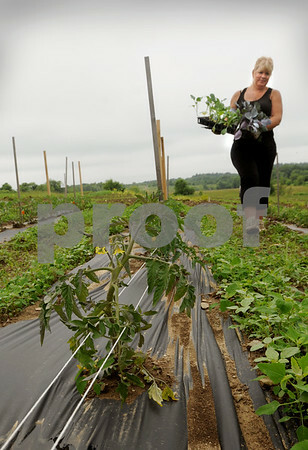 West Newbury: Cindy Adams of Long Hill Farm in West Newbury carries kolrabi to transplant past a row of tomato plants just showing yellow flowers. The cool, wet spring has been a detriment to crops like tomatoes, basil and corn which need hot weather and sun to mature. Bryan Eaton/Staff Photo Newburyport News Tuesday June 30, 2009.